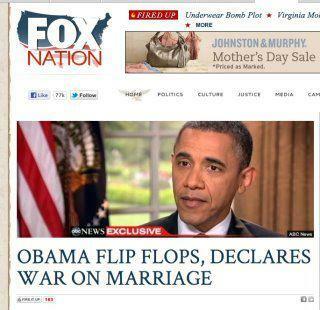 Yes, the "Fair and Balanced" network declared that the President "Declares War On Marriage". Now I realize that other media outlets are slanted left and Fox is the conservative alternative, but seriously, "declares war"? On what planet is this even rational? I know, in the minds of Fox News editors this is a better headline than, say, "Murdoch Declares War on Phone Privacy". Courtesy of the coolest guy on Facebook, George Takei.